Many times, in tournament play, you may have faced irritation in playing against a player who has pips out on both sides. A popular combination is long pips on the backhand and short pips to finish off rallies on the forehand. We will consider classical long pips with maximum effect (hence minimum sponge and so on). We can deal with the short pips first. Many good players get confused even to handle the short pips side in matches. The reason is that the prospect of facing a very strong both sides pips player is mentally daunting for those who fear such a combination or have faced defeat at some point in their career. In case of short pips, you need to remember that this rubber is just designed to neutralize spin. So, if you deliver a service with good spin, the short pips simply neutralizes it. The same holds true for backspin, topspin or sidespin. The rubber simply absorbs the opponent's spin. So there are just a couple of things to remember while playing against the short pips side. When you play deep underspin or deep topspin or a spin service, expect a normal return almost like a float. You can almost play normally against this side if you understand the basics of facing this kind of rubber. The long pips side could be a bit trickier, but again if you understand the logic behind the functioning of the rubber, it may be easier to tackle it. 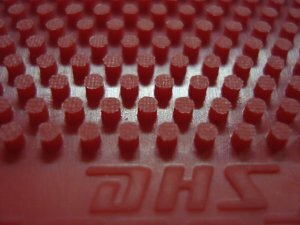 Some popular long pips rubbers are Butterfly Feint, Dr Neubauer Monster Classic, DHS C7, Stiga Destroyer, TSP Curl and so on. The grid density, the aspect ratio are advanced concepts that are out of the scope of this article. Once you understand the starting concepts, you can extrapolate and understand the advanced too. The most important thing to note against long pips is that the type of spin you play against it is reversed back to you. So, topspin comes back to you as underspin, underspin comes back as topspin. Sidespins are returned as complex wobbles due to the ball fighting opposite forces. When you play a topspin, you are mostly forced to play a push on the next ball since the underspin is heavy, especially against spinny loops. 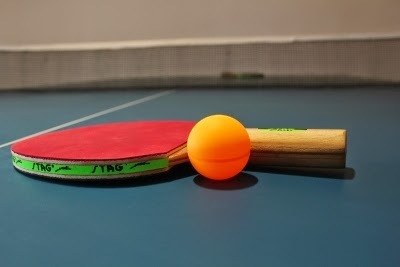 When you play a push, the ball comes back as topspin and many players hit the ball out thinking that what they see is just a push (it is topspin). Now, when you face a player who has short pips on the forehand and long pips on the forehand, keep your body balanced always and be ready for unexpected ball movement. The easiest strategy is to play normally on the forehand and concentrate on that side most of the time. When you do hit a topspin on the backhand, expect heavy underspin and push the next ball, get into position and only then hit the next ball.